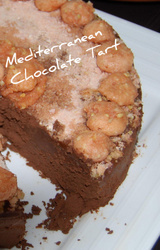 Looking for a decadent, wonderfully delicious, chocolate tart recipe .....look no further. It's really quick and easy to make, and then, if necessary, can be stored in the fridge in its tin for a couple of days till ready to serve. I made it for the great party we had to christen our new outside kitchen, and it went down really well. You only need a small portion as it is very rich. 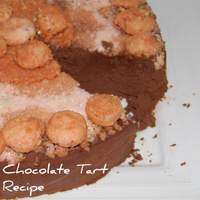 Great served with a big bowl of lightly whipped double cream that has been flavoured with a little amaretto liquer. You will need a 10"/25cm high sided (or 7"/25cm for the smaller one) cake tin that is lined with a circle of foil and then evenly greased with the melted butter including the sides of the tin. Take approx 3/4 of the biscuits, crush well, and sprinkle them evenly over the base of the tin. Melt the chocolate with the glucose and rum/brandy by gently buzzing in the microwave, removing and stirring regularily, or in a bowl over a pan of simmering water - make sure the bowl is not touching the water. Keep stirring till completely melted. Whisk the cream in another bowl until it starts to just slightly thicken. Fold half of this into the chocolate, then fold this into the rest of the cream. Pile this mixture into your lined and greased tin and evenly spread it out so that it is as flat as possible, and cover with cling film. Bring out of the fridge about an hour before serving for it to acclimatize. To serve, run a sharp knife around the outside edge of the tart. Then turn it over carefully and tip it out on to a serving plate, it actually comes out quite easily. Carefully soak the remaining macaroons/amaretti biscuits in the chosen liquor and arrange around the edge of the tart with a couple in them in the middle....see picture. Serve immediately with whipped cream.